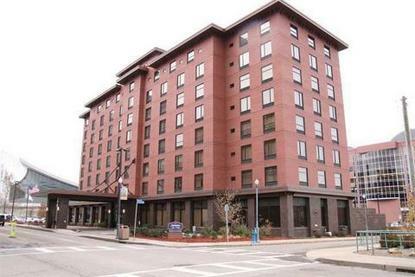 The Hampton Inn & Suites Pittsburgh Downtown is Pittsburgh's newest hotel and the only hotel with complimentary parking downtown, located in the historic Strip District, offers both business and leisure travelers a home away from home. Just minutes from all Pittsburgh has to offer, including both financial and theater districts, Heinz Field, PNC Park, Mellon Arena and within walking distance of the open markets, restaurants and night life of the Strip District, the brand new Hampton Inn & Suites Pittsburgh Downtown is sure to meet the needs of any traveler. A guest of Pennsylvania's Hampton Inn & Suites Pittsburgh Downtown will also find themselves just a short drive away from the University of Pittsburgh, Carnegie Mellon, Duquesne University and the renowned University of Pittsburgh Medical Center.Guests of the Hampton Inn & Suites Pittsburgh Downtown will enjoy a number of complimentary services including free downtown parking, On the House hot breakfast, wired and wireless High Speed Internet Access and a Business Center.Hampton Inn & Suites Pittsburgh Downtown guests can relax in our indoor swimming pool and whirlpool area, work out in our on-site fitness room, or enjoy our 24 hour coffee, tea and hot chocolate bar. A guest in need of a quick snack can visit the Hampton Inn & Suites Pittsburgh Downtown's Suite Shop located in the hotel lobby.All stays at the Hampton Inn & Suites Pittsburgh Downtown are backed by the 100% Hampton Guarantee--if you are not 100% satisfied with your stay--you don't pay That is 100% HamptonWe love having you here in Pennsylvania at the new Hampton Inn & Suites Pittsburgh Downtown.